Well, not really (at least not in any language that I speak); however, mushrooms exposed to the UV rays of sunlight have been discovered to be a wonderful source of the important nutrient we call Vitamin D.
Research shows that exposing mushrooms to sunlight naturally creates bio-available Vitamin D in such abundance that you can get your daily-required amount of Vitamin D from eating a 3-ounce serving of these sun-kissed fungi. Long associated with healthy bones and the maintenance of good health, Vitamin D is often added to milk products and other foods to ensure that we get enough of it — especially in winter when many North Americans have limited exposure to the sun’s rays. Recent studies are persuading health experts to give Vitamin D even more emphasis since studies have linked this nutrient to quite a few other health benefits in addition to bone health. Recent research has shown vitamin D to be associated with a healthy heart and early results from on-going studies are suggesting a possible link between low levels of vitamin D and cancers such as colon, breast, pancreatic, and lung. UV-treated mushrooms are not on the market yet in Canada yet (rigorous research is being conducted by Mushrooms Canada and the Guelph Food and Technology Centre to ensure the process is 100% flawless) but SunBella mushrooms from California are now available in the United States. Have you changed your eating or supplement habits recently due to news about Vitamin D? And, if you had access to these sun-drenched mushrooms, would you switch to them over regular mushrooms? This entry was posted on Tuesday, December 9th, 2008 at 7:30 am and is filed under Fruits and vegetables, Nutrition and health. You can follow any responses to this entry through the RSS 2.0 feed. You can leave a response, or trackback from your own site. You know what? I’m going to need to try to reintroduce myself to the mushroom. It’s not been too good to me lately – lol. Thanks for dropping by my blog! 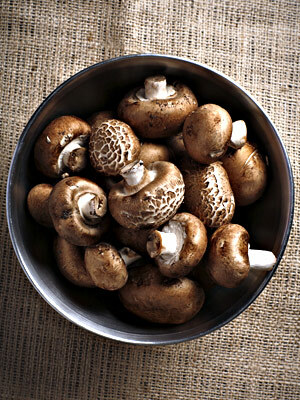 I had no idea that mushrooms are so good for you, even when it comes to fighting winter blues. UV-treated mushrooms sound really interesting, but I’ll have to see the cost before I switch. Dana, thanks for the info. My family love mushrooms, and we eat them raw, or cook pretty regularly. I never knew that mushroom contain vitamin D. Always good to know! In the olden days [when I was a child] – it was a routine practise to lay out mushrooms on flat baking sheets and dry them in the sun. They were rehydrated during the winter months and always tasted wonderful! Guess it is not such a new idea after all. Your picture made me laugh because I just sauteed a whole mess of garlicky mushrooms last night to eat on crackers while I was making pizza. I tossed a big scoop of them on my portion of the pie, too. Delish! I’ve been reading more and more about vitamin D lately and now make sure that my calcium supplements have D in them, too. In California, we get plenty of year-round sunshine, so I’ll continue buying mushrooms at the farmers’ market and not seek out fortified ones in the store. That’s really interesting! According to my doc, I am “Severely D deficient” (apparently this is common in Seattle…I think you can figure out why)…good thing I love mushrooms! I love mushrooms and am happy to use any excuse to eat more of them. Being fair skinned and living in Canada, I don’t get much Vitamin D from the sun. I avoid exposure in the summer and winters are so grey I’m sure the sun’s gone on vacation. I’d rather get my D from food than supplements, but will take it any way I can these days. How interesting! Yes, I would switch over to them and will have to check and see if they’re available in the US. I love mushrooms in any case, so this is just more good news. Thanks. I really like mushrooms and I would certainly try a new type. I finally have a good reason to get more mushrooms into my family’s diet. I LOVE them, but I can’t say the same for the rest of the family, especially my husband, but he’ll be more willing when I can tell him the benifits of them. BTW what nutrients are in regular mushrooms? Great information Dana. It is also a little know fact that white and shiitake mushrooms actually contain a small amount of Vitamin D naturally, without the use of UV equipment. White mushrooms contain approximately 5% of your DV, while shiitakes bring in about 48%. All that Vitamin D in a single 100 g serving. Thanks for adding this valuable info – this is great news in light of the growing evidence that highlights Vitamin D as such a dynamic nutrient!